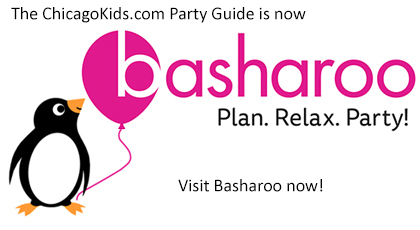 ChicagoKids.com - Best Kids' Birthday Party Locations in Chicago and suburbs. We've got the best places for kids birthday parties in Chicago and the suburbs! Find the perfect spot for your next kids' birthday party. Find amusement parties, arts and crafts parties, sports parties, dance and music parties, jump fun parties and more. Our private indoor arenas are filled with gigantic inflatable bounce houses, slides and obstacle courses. Relax and enjoy your guests at "The Inflatable Party Zone' while our staff takes care of everything. KSL offers unforgettable and unique science birthday parties for children ages 4-12. Parties include interactive hands-on science fun, use of our inspiring and unique spaces, inspiring theme options, and full setup, staff and clean up service. Locations in Lincoln Park, South Loop, Northbrook, Wheaton. The perfect birthday party location for your LEGO fanatic. Enjoy over 3 hours of LEGO-themed fun including rides, a 4D movie theater, a new Pirate Adventure Island playland and more! Our 3,000 sq ft space offers four fun filled rooms and 20 different theme parties that range from Princess and Superhero parties to Spa and Carnival parties. Celebrate your child’s special day in culinary style. We reserve our entire kitchen studio just for you and take care of all the details so you can sit back and enjoy. Birthday Parties are Better at Bit Space! At a Bit Space birthday party, kids will be able to use real tools to build real things and will have a blast along the way. Make your party the most memorable day of the year and celebrate it with us at the Bulls/Sox Academy! Pick and choose your fun and make it a COMBO PARTY! With games, music and fun activities created especially for your birthday kid, there just aren't enough synonyms to describe how awesome an Awesome Birthday Bash truly is! The Little Beans Café birthday experience will be the most fun party in town for both kids AND parents. We fulfill all of the desires and wishes of our birthday child to make the party a birthday celebration they’ll never forget! Come Experience Why Jump!Zone Is Chicago's #1 Party & Play Facility! We Offer 12 Giant Themed Inflatables In A 20,000 Sq Ft Indoor, Climate-Controlled Arena. Join Us at Jump!Zone for Great Parties and Walk-In Play! Purple Monkey Playroom is a 1,500 square foot playspace and party destination on the border of Bucktown and Logan Square. Since 2012, they've created award-winning celebrations for children celebrating their 1st - 6th birthdays. Purple Monkey offers everything from basic space rental to full-service, custom celebrations. Brunswick Zone of Algonquin - Randall Rd.